Locks Gallery is pleased to present a gallery talk and conversation between curator Erica Battle from the Philadelphia Museum of Art and June–July exhibiting artists Nadia Hironaka and Matthew Suib, discussing their new work Mirrors, Marks & Loops. The gallery will also be celebrating Of Other Spaces — a group video show containing a trio of works from David Dempewolf, Ragnar Kjartansson, and Eve Sussman & Rufus Corporation. 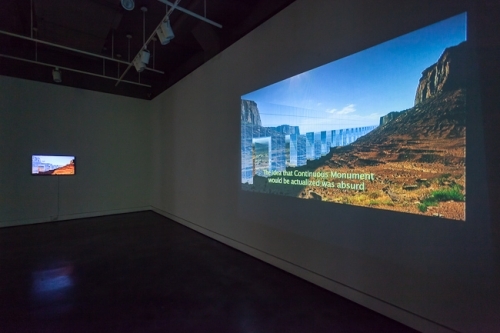 In dialogue with Hironaka & Suib\'s Continuous Moment Part 1 on view in the first floor, each of the works in Of Other Spaces utilize performance and/or new media to re-imagine historical narratives and the context of the places they occur within. The gallery talk will begin at 6 pm; we encourage attendees to come early in order to have an opportunity to watch the time-based works.